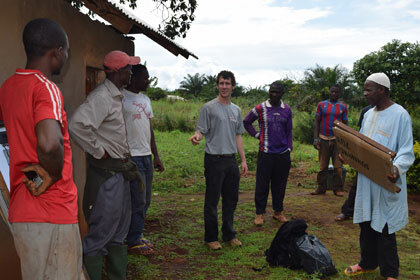 University of New Brunswick (UNB) alumnus, Caleb Grove (BSCE Mechanical, 2015), has begun a project through his startup, Mbissa Energy Systems, to develop sustainable energy systems for use in rural Africa. Mr. Grove and his family moved from New Brunswick to Cameroon when he was eight years old. Three years later they settled into the small rural community of Bambalang, in the mountainous North-West region of the country. Mr. Grove says that growing up in the area and being accepted by the people who live there has provided him with a unique perspective that allows him to see some things that are needed in rural West Africa. Time spent wandering the dusty roads of Bambalang led Mr. Grove to the small island of Mbissa, a community of about 3,000 with no possibility of grid development. The significant wind resource of the island was the seed for the idea of locally-sustainable wind energy. While attending UNB, Mr. Grove took a Technology Management & Entrepreneurship elective. He was working on a group project that contemplated the idea of creating wind turbines in Africa when Dr. Dhirendra Shukla, chair of the J. Herbert Smith Centre for Technology Management and Entrepreneurship, encouraged the group to think about their idea seriously and to promote it. They won the Social Innovation award at the 2013 TME Pitch Competition. Dr. Shukla has continued to encourage Mr. Grove to work through this idea and TME has provided Mbissa Energy Systems with the initial funding to help begin the pilot project. “It’s gone from being a sort of dream to being something where I've thought...maybe I could do this,” said Mr. Grove. The central hub of the system for the pilot projectis a clinic in Mbissa, which through solar panel technology has access to light 24 hours a day for the first time. The clinic also acts as a battery charging system, supplying part of the community with electricity through rechargeable batteries that can be carried by hand to homes in the surrounding area. For a small fee, members of the community are able to take a battery to the clinic for charging and bring it back to their home to provide electricity for several days. It’s through charging this small fee that the system will be able to grow. Grove says that in a year or so, the preliminary system will be fully paid off and the clinic should be able to put in a second system, expanding their reach in the surrounding community. “The second goal... is to give people knowledge they can use to break the cycle of poverty. It’s using knowledge as a tool." The most important thing about this work is to make it sustainable, said Mr. Grove. Rather than coming into the area and providing the community with electricity, he hopes to teach members of the community to create it for themselves using locally available tools and materials. “I’ve got to be able to leave and have it continue”, says Mr. Grove, who in five years would like to have people in the community training a second generation and expanding the project to neighbouring areas. Mr. Grove is a strong believer that, while people in the west can help the people of rural Africa with our material wealth, the people of rural Africa have much to offer in return. "I see myself as a bridge that spans the gap between two very different worlds,” said Mr. Grove. "My desire with the project and the ones that may follow is not merely to see electricity in Africa and is not to make Cameroon merely share in the material wealth that fills richer nations. My dream is to have people cross that bridge; I want those from Canada to 'see' Mbissa and Cameroon and Africa and the people who live in it and allow themselves to be fundamentally changed by what they see. I certainly want us to participate in their lives by sharing what we own and funding the project and funding specific needs in similar areas; however, my hope is to see a deeper connection grow as Canadians can see the photos and videos, letters and stories that return with me. I see it as 'transporting' people to Bambalang. I want them to hear directly from the people who's lives they have touched so that their own, in turn, may be greatly affected."